A few months ago I joined a web site “Dirt Fishing Australia” on this site there are really great people that post information, pictures of their finds & general chat as well as organize trips. I was fortunate to join in on a trip organized by a Robo (all round great guy to meet & know) to do a bit of Gold hunting & Camping. On the day we arrived we all met up (my first camp & meeting with these guys). Between 6 – 7am we setup camp & then started having a bit of a detect around the campsite. At first swinging around all I was finding was 10c pieces & the usual aluminium rubbish then Logan suggested I talk to John (as he’s had his Minelab CTX 3030 for about 3 years) & see what settings he ran. Off I went & John was only to happy to help he set me up with the settings he uses. Well BAAMMMOO within 10 meters a beautiful sounding target so I started to dig, got down about 4inches & not what I wanted to see just a piece of rusted metal but I swung the CTX over the hole again n yup still there so dug a bit more & over to the side of the hole out came a fabulous 1846 Queen Victoria Four Pence. Wow I called out, then the others congratulated me & we all went back to hunting. 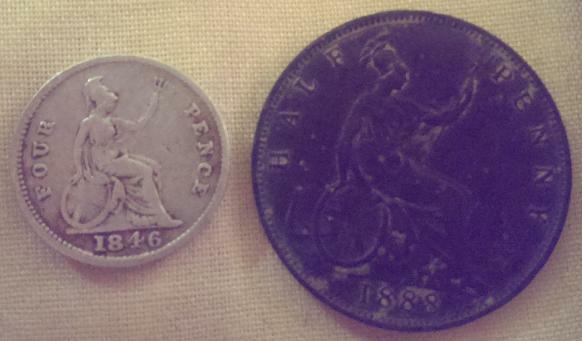 Must have been about half an hour or more went past, John & Logan were up under a tree having a break n drink & BAAMMOO again I dug down about 5 inches & here it was BIG & Beautiful a 1888 QV Half Penny. Oh I was over the moon & had to go & have a break. 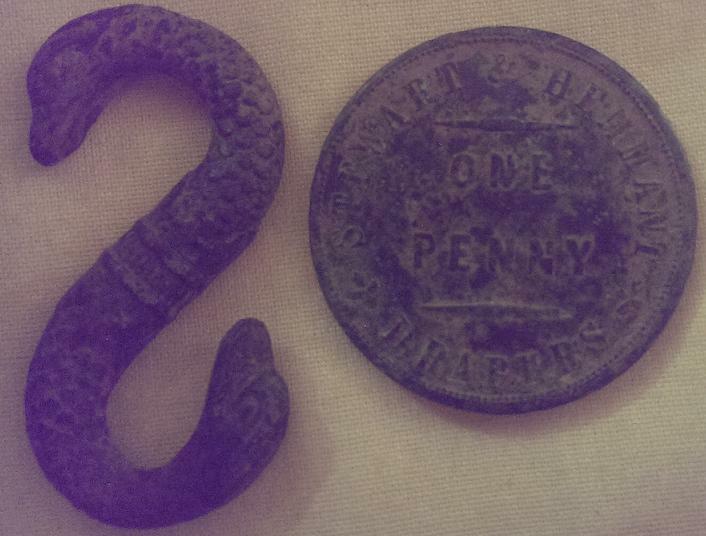 To get not 1 but 2 awesome 1800’s find’s in one hunt I was so so excited & happy, the others were finding really great finds too. We all got together & showed each other our finds then went bush for some nugget hunting, although we weren’t successful & didn’t find any Gold. Since this camp I’ve gone back to the camp site with the CTX 3030 had another couple of hours hunt & what do you know WOOHOO I came home with another 2 great items from history. 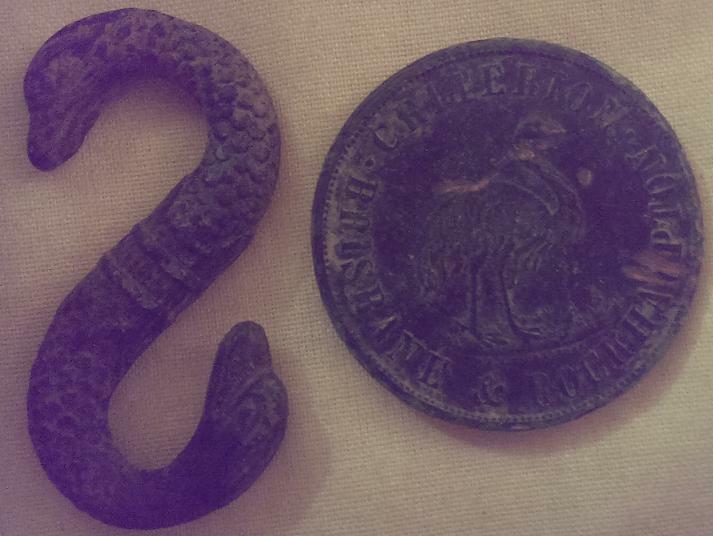 A really nice BRISBANE ROCKHAMPTON CRITERION – ONE PENNY coin/traders token & a nice what was identified as a SNAKE BUCKLE. 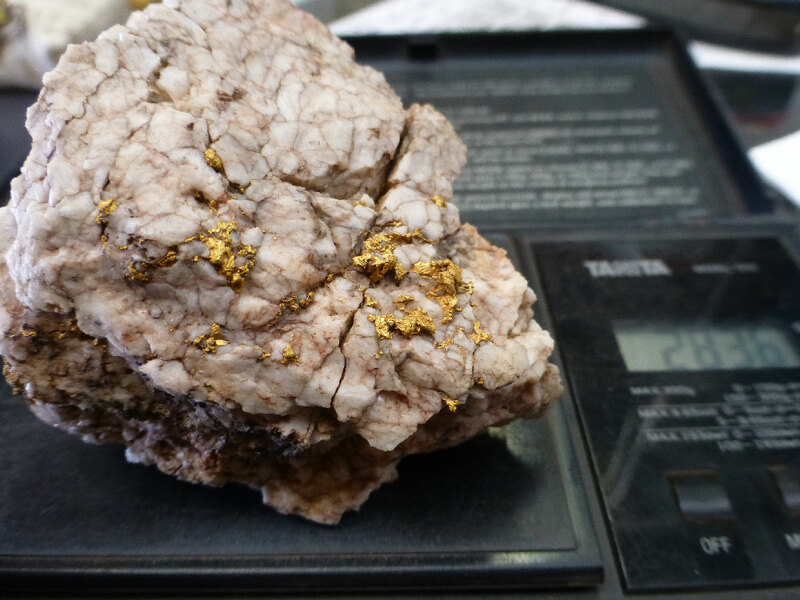 BRISBANEGOLD – Miners Den, this is my second detector supplied to me by them & they offer awesome information, backup service & friendly staff. BIG THANKYOU to MINERS DEN for all the help on purchasing the right equipment first time for the right job & finds that I am interested in finding. Cheers thankyou for reading my little adventure story so get out & get in the dirt. 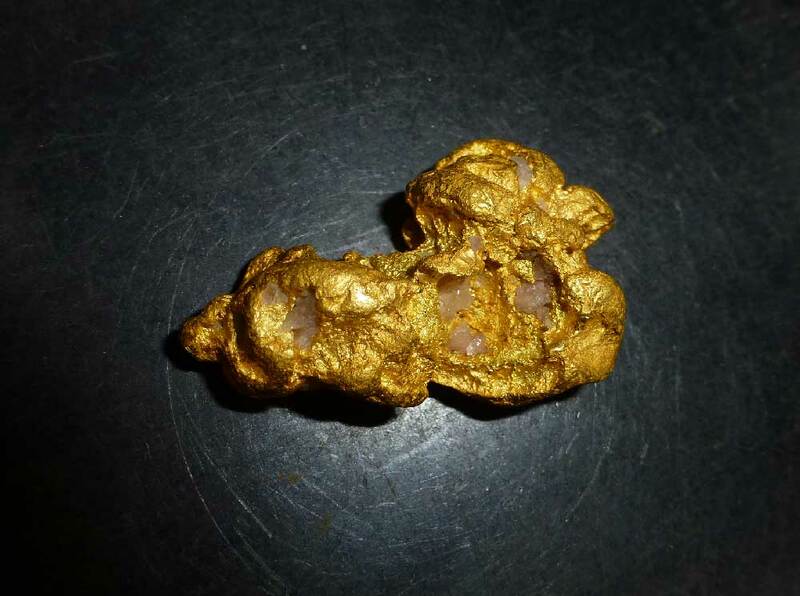 Recently my work mate, David Turner, informed me a customer had bought in some great but unusual gold found with his Minelab GPX 5000, including a very large and heavy rock with some colour showing through. Well today was my lucky day as our customer came back in to show me the pieces! Within the first hour came the small clean 1 grm nugget, the customers’ first ever piece! Followed shortly after by a clear but faint ‘high-low’ target. After about 2 feet of digging a large rock of about 2kg was unearthed and found to be giving a very strong signal. 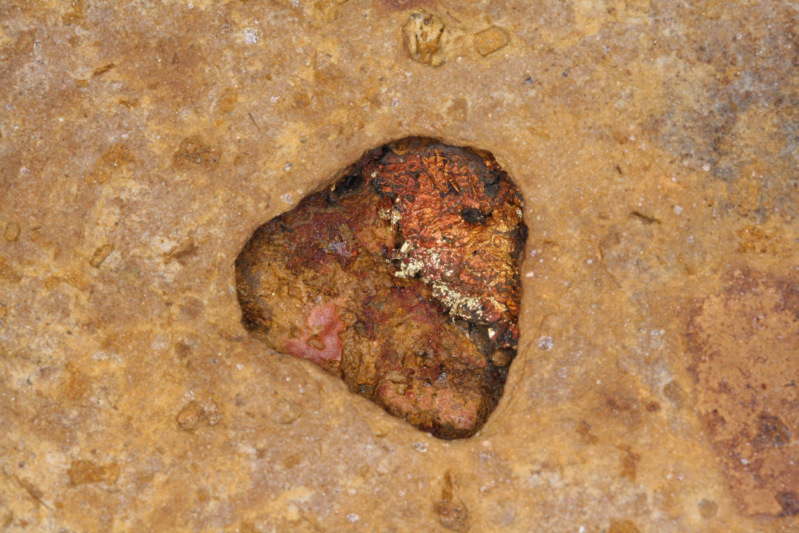 The rock was discarded as it was thought to just be a hot rock, however after a short while curiosity took over and the rock was picked up and examined closer- sure enough there was a tiny glint of gold. 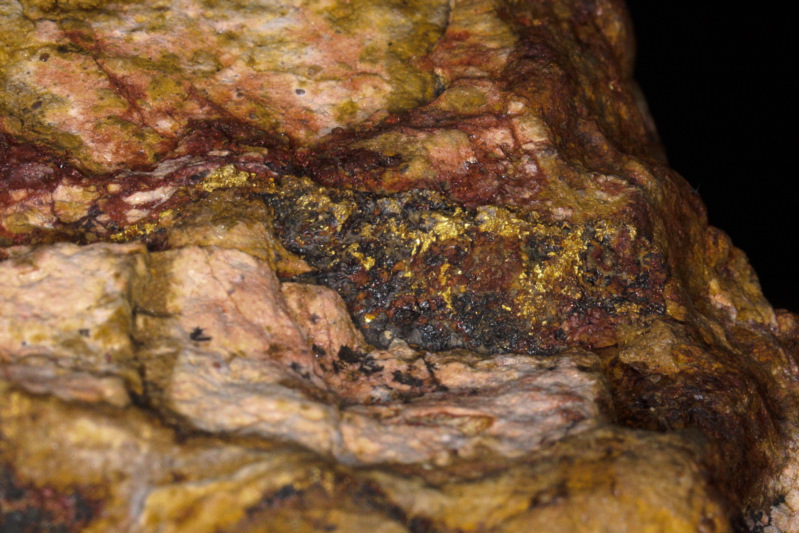 After cleaning it was seen to have gold showing through all the cracks and interfaces of the rock- all up between 3 – 4 oz of gold in it! The next day not far away from the rock specimen, the 2 flat pieces were located- screaming junk signals- both in one hole! 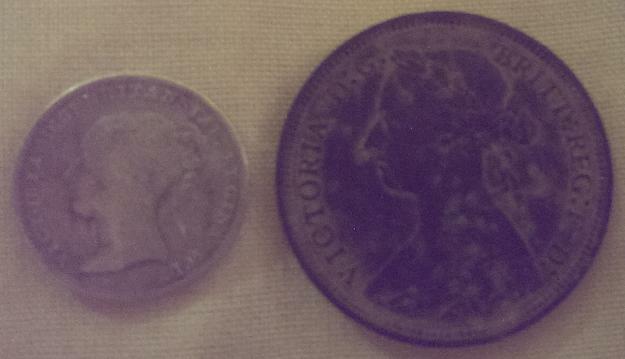 One was about 11 grams and the other about 4 grams, both coated with a very chalky brown ironstone like material. A very exciting and unique first find for our customer and hopefully the first of many! 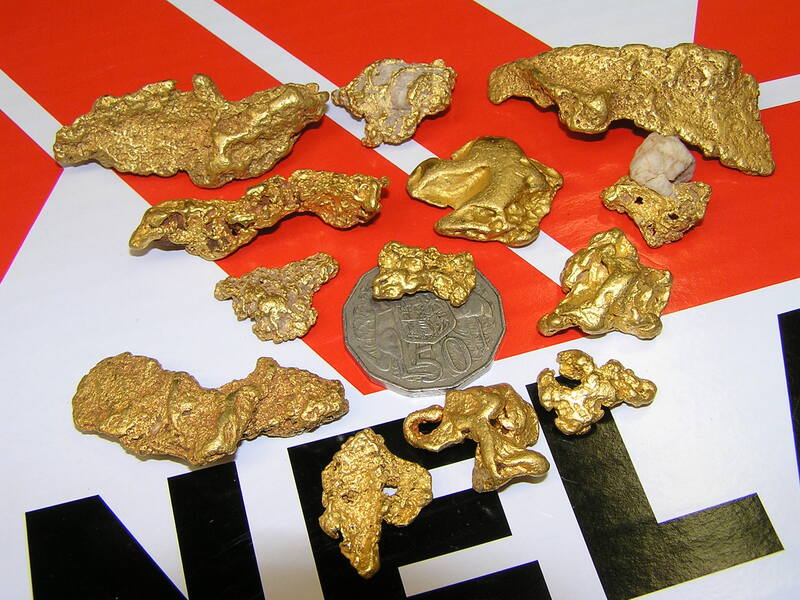 A BendigoGold customer recently showed us a collection of stunning gold nuggets he and his wife had found over the past 3 years with a Minelab GPX 4000 and GPX 5000. Most of the nuggets were found using a Nugget Finder 12” x 7” Mono coils. I was out detecting with the Minelab GPX 5000 metal detector with the 11” Commander Mono Coil in a spot near a quartz reef. We found a small piece of gold on the Saturday, it was the only piece we found but decided to return on Sunday for a more thorough look, as we thought the spot had more potential. Returning on Sunday I began detecting and heard a faint signal and began digging. After about a foot down, and underneath a very large quartz rock, I unearthed this quartz specimen with gold showing all through it. A specific gravity test on the rock suggests approx. 26 grams of gold within it. We also found several other nice specimens and nuggets in the same area. 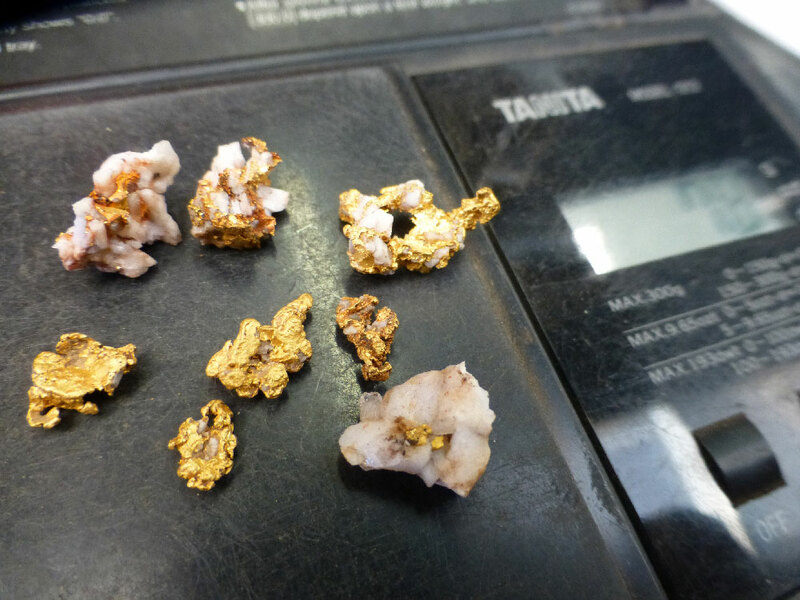 A BendigoGold customer recently showed us some of his great finds. 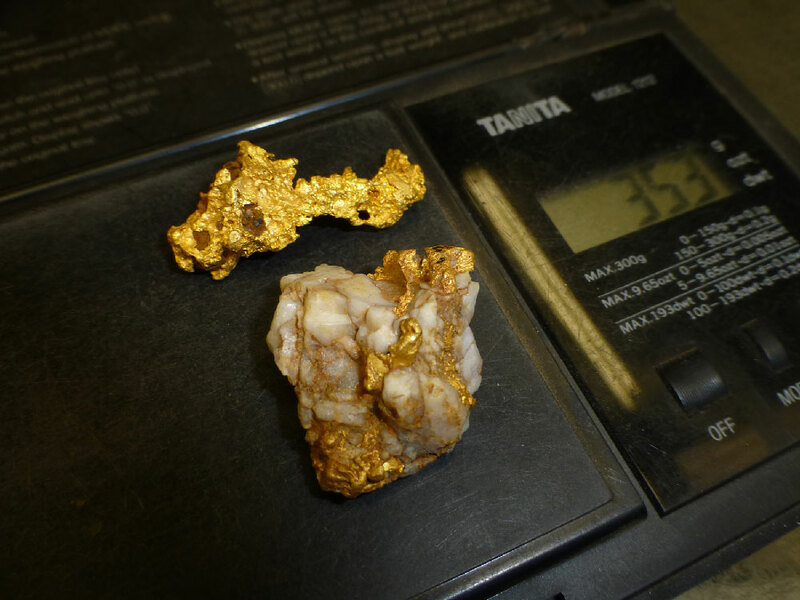 One was a 222.6 gram gold nugget. 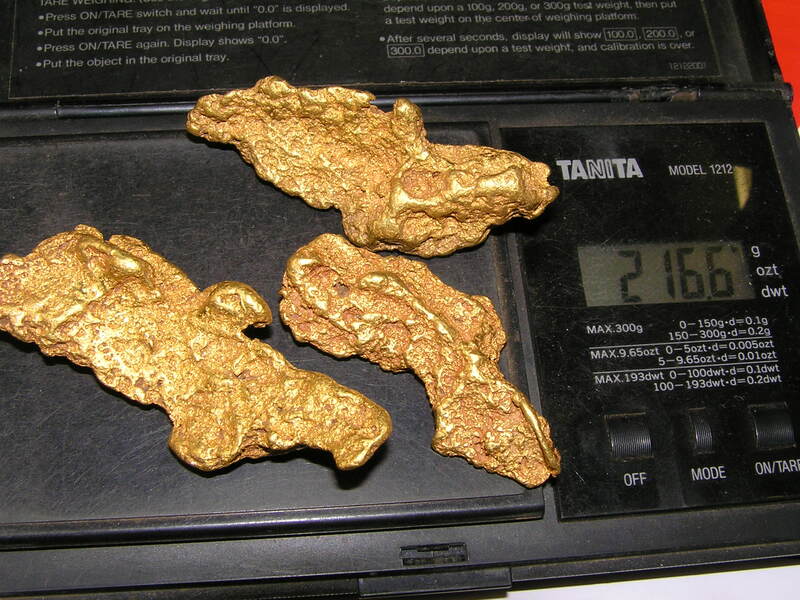 The nugget was found using a Minelab GPX 5000 metal detector with a Nugget Finder 14″ x 7″ Elliptical mono coil. 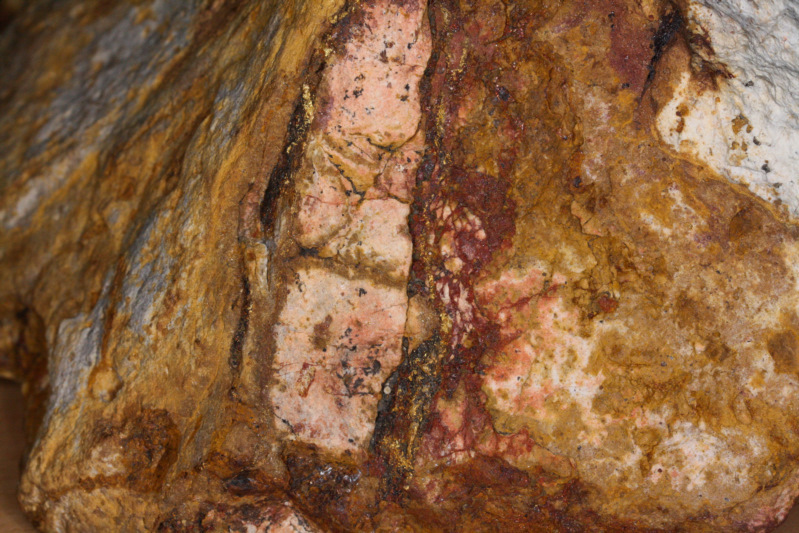 It was found at a depth of around 12″. The ground was very hard & dry, it was virgin ground. 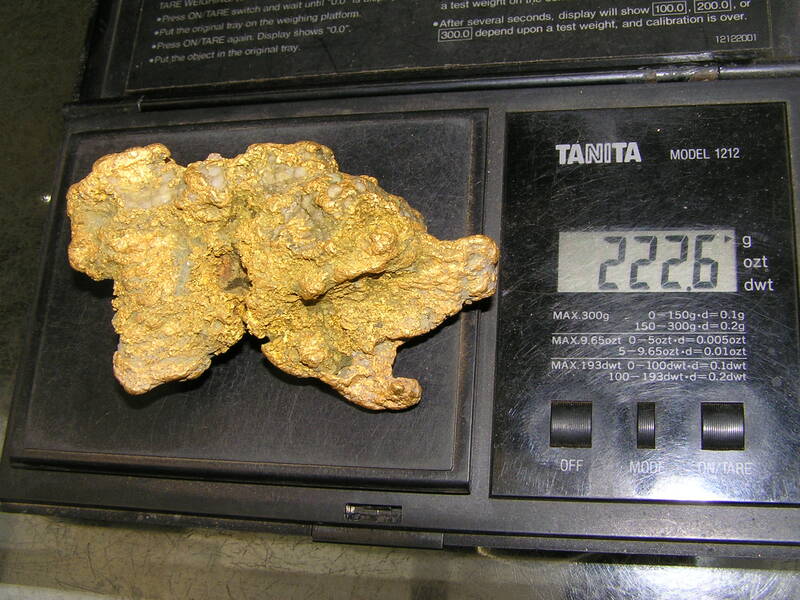 The nugget was very dirty when pulled out after cleaning in hydrochloric acid it weighed 10 grams less. What a great find!! Not a bad day’s prospecting! 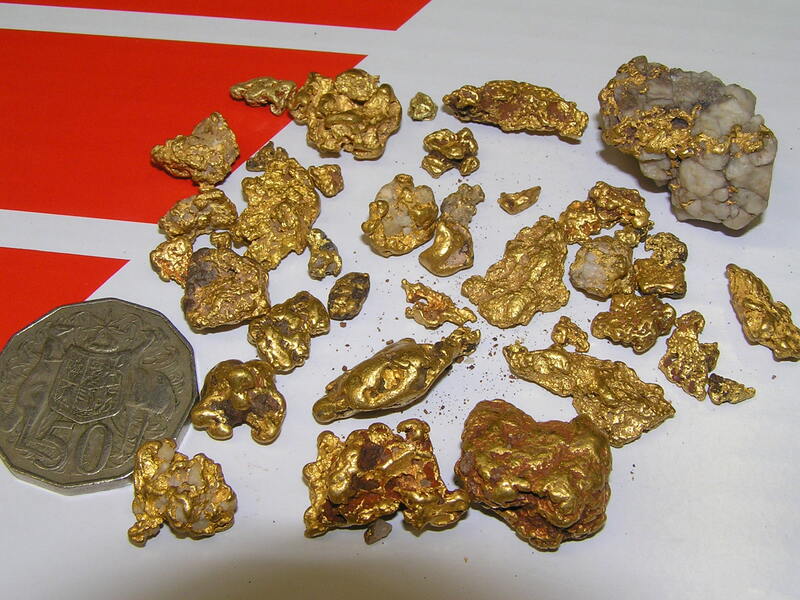 A BendigoGold customer recently had great success with the Minelab Eureka Gold Metal Detector. Congratulations to the prospector.. I went for a drive out the bush in some new areas looking for quartz outcrops to try out my new rock hammer . 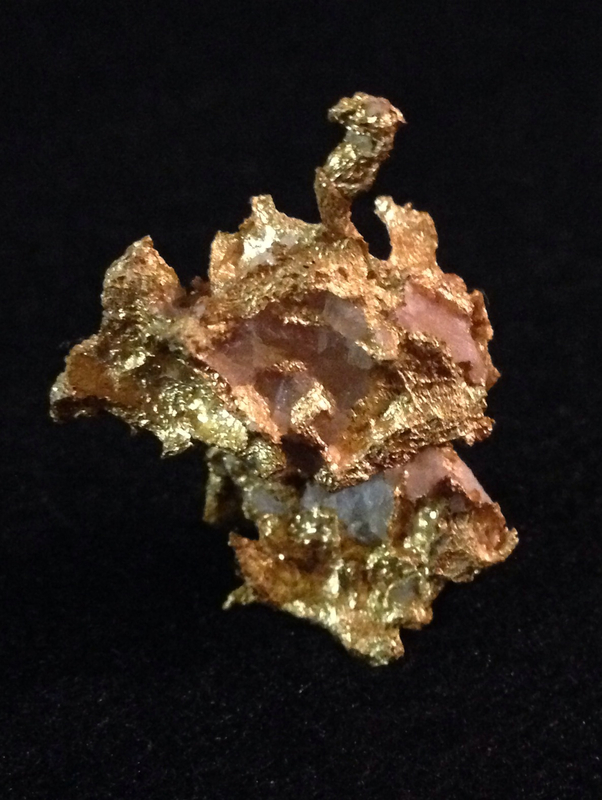 I came across a nice quartz area and the area looked gold bearing so I also ran my Minelab Eureka Gold Detector with the Coiltek 6” Goldseeker Coil over the area to see if there were any signals around it. I found many rubbish targets straight away and after about 40 minutes I heard a rather large signal and began digging. It was about 6-8 inches deep until I got the target out and there was this beautiful quartz specimen full of gold. Within a foot of that one I got another good signal and similar depth, out popped another beautiful nugget ,again with some host rock still attached. 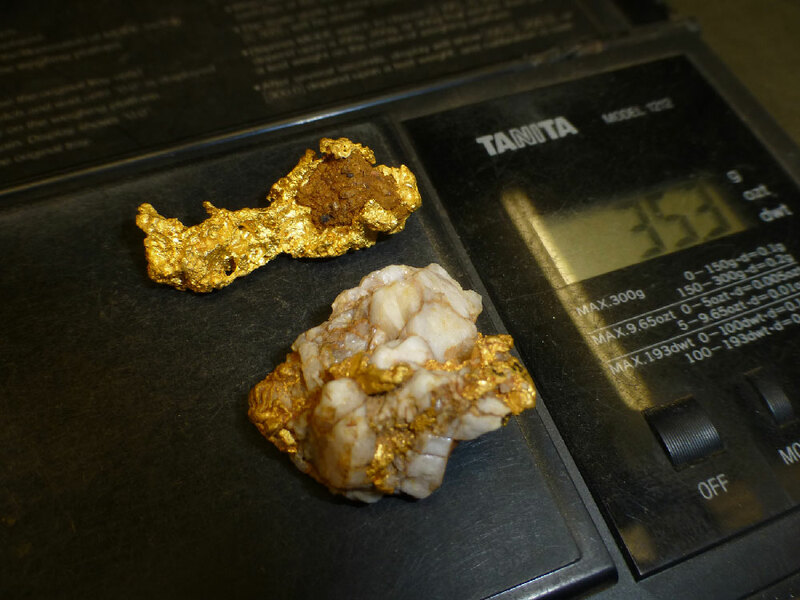 A couple of beautiful gold specimens thanks to the Minelab Eureka Gold, paired with the Coiltek 6” Goldseeker coil. 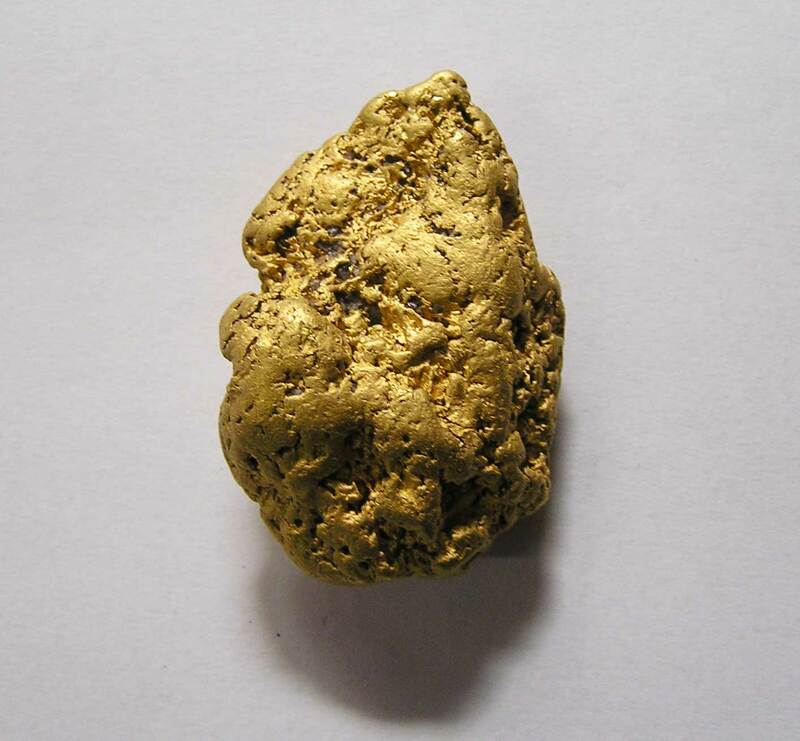 A customer from BendigoGold recently showed us a beaut 138.8 gram gold nugget. It was discovered in South Gippsland Victoria at the start of February. 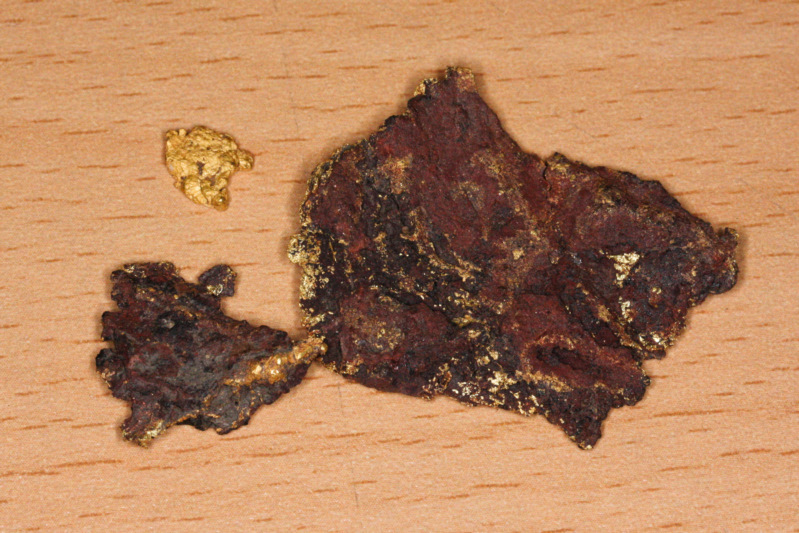 Found in an old workings area the prospector shovelled dirt into a gold pan first and then detected it with a Minelab GPX metal detector. 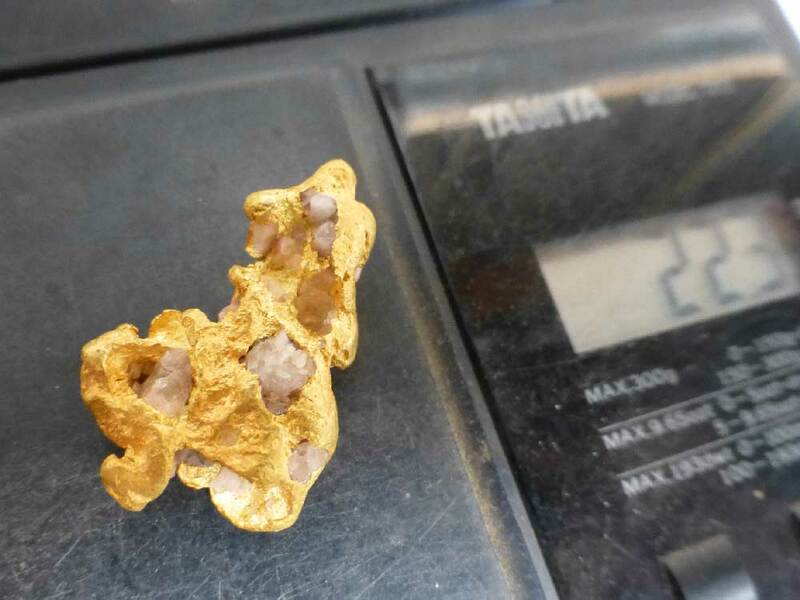 A BendigoGold Customer found a beautiful 22.3 gram specimen with quartz still attached. 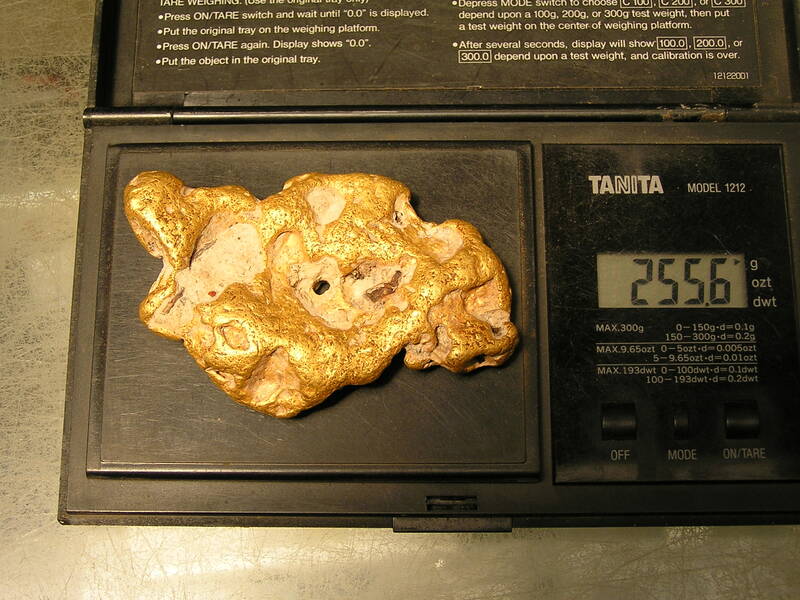 It was found using a Minelab GPX 5000 Metal Detector using a 12″ x 7″ Nugget Finder Mono Coil. 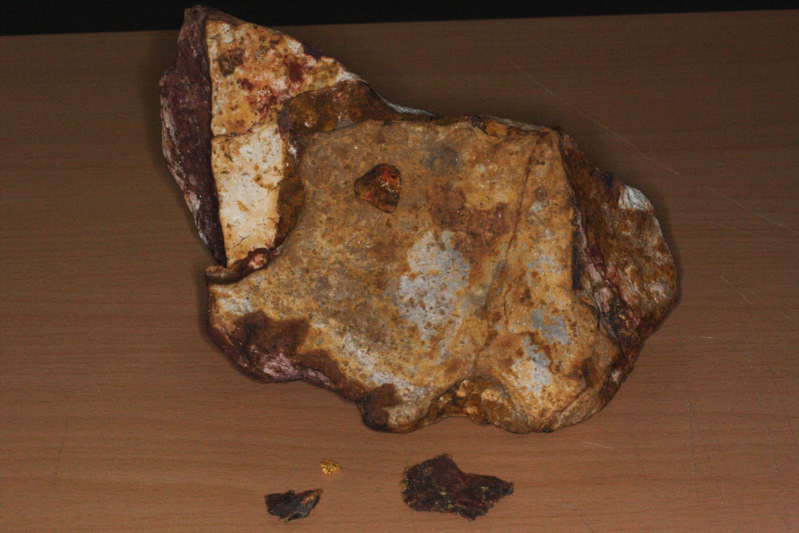 The ground was highly mineralised and the specimen was found at a depth of about 10”. Due to the high mineral level of the ground there was only a faint signal but the prospector was well rewarded with this beautiful piece. 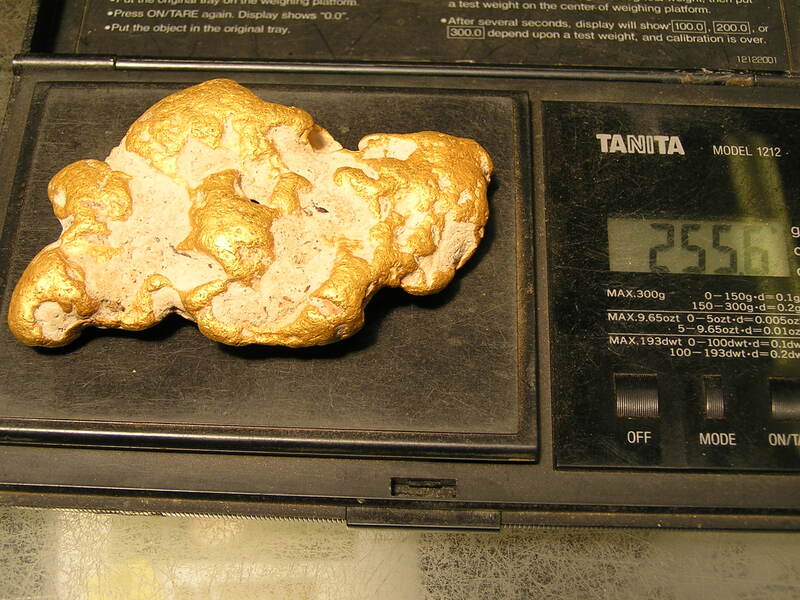 A customer came into the BendigoGold shop recently showing us his 256 gram nugget (8.2ounces). It was found on the side of a hill. The customer had stopped and seen a likely looking spot and decided to have a search with his Minelab GPX 5000 metal detector and Nugget Finder 17” x 11” mono coil and found a couple of tiny bits of gold. He then heard a massive loud signal and thought it would be junk but decided to have a dig anyway. From only about 8 inches down in solid hard ground popped out this awesome nugget. He was very lucky not to hit it with his pick. It was found on Christmas eve 2013. What a fantastic Christmas present! 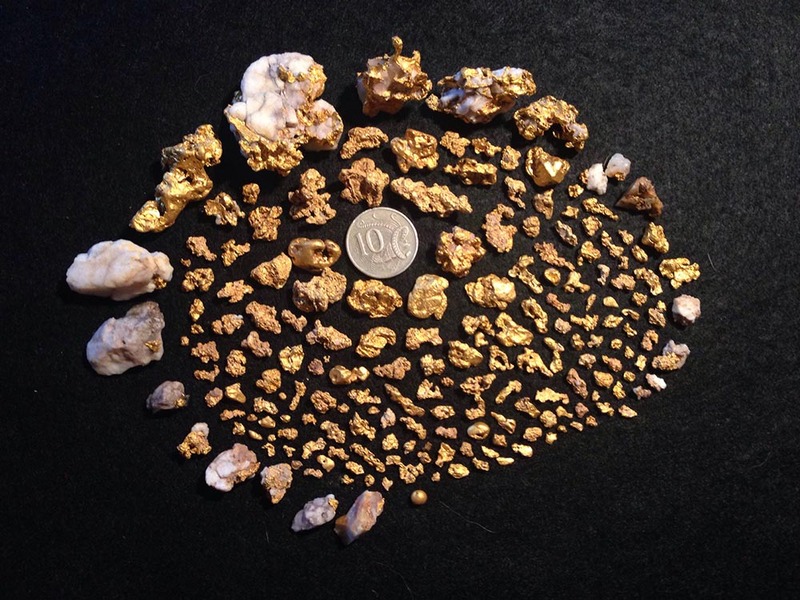 2013 was a great year for one prospector who sent in a photo of his finds from the last 12 months. 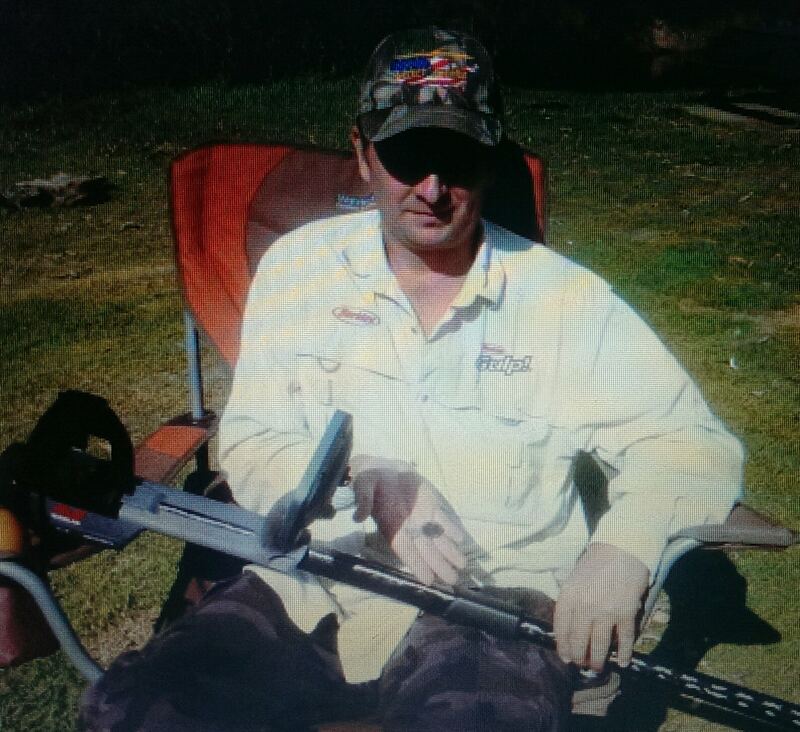 Using a Minelab GPX 5000 Metal Detector with a Rooster Booster he has found close to 14oz’s in Victorian Goldfields. The nuggets range from 0.06g to 1.5oz using a few different coils but the best all rounder coil he found was the Minelab 11″ Commander coil. Congratulations to the prospector and we hope 2014 is an even better year! The Miners Den Australia Blog is the first choice for prospectors Australia wide to keep up to date with the latest information relating to Adventure, Treasure & Gold Prospecting hobbies. Backed by Australia's only network of Premium Minelab Metal Detector Superstores, across three states, and a team of Minelab certified staff we are sure to be the first to let you know about important updates, interesting stories and informed comments about the products you are using or thinking of purchasing.